Welcome to #7! Many thanks for the kudos on the new look of the Connection, and for the compliments on the cover design on the last issue. All comments, good or otherwise, are always appreciated. Greetings also go to everyone who has become part of the Connection since last time and thanks to those who have participated. As always, your reviews, photos, art work, classifieds, letters, etc., are welcomed. I hope all of you had a great summer. For those of you in Europe, I'm sure you especially enjoyed the many opportunities to see Luka since the beginning of June right up through September. In early August, Luka played the annual Feile in Thurles, Co. Tipperary. He then went on to Belgium and Germany, playing at various outdoor festivals. Moving on to the early part of autumn, on October 2nd, he headlined at Dublin's National Stadium, along with The Frames and Russian gypsy-folk band, Loyko. See inside for a review on that show. 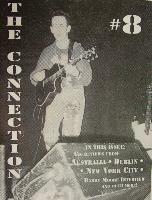 On the 4th, he pedaled on north to Belfast, where he played at the Limelight. October and early November found him playing mostly on the US west coast, with one date in Canada, and three on the east coast, with almost all the venues being of the small and intimate variety, at which I've always felt Luka gives his most enjoyable and memorable performances. On October 14th, he began his North American leg of the tour with a Canadian show, at Vancouver's East Cultural Center. Then it was down the coast a bit, into the US, for a show on the 15th at Backstage in Seattle, WA. He played two shows in Oregon, one at RKCNDY in Portland on the 16th, and another in Eugene, at Taylor's College Side Inn, on the 17th. Luka then stayed in California for a bit, playing first at New George's in San Rafael on the 19th, then two shows at San Francisco's Great American Music Hall on the 20th and 21st. On the 22nd he played in Santa Cruz, at the Kuumbwa Jazz Center, then onto Davis, doing a show at the Palms Playhouse on Friday, the 23rd. Heading further down the coast, Luka played in Los Osos, at Sweet Springs Saloon on the 24th, in West Hollywood's Troubadour on the 26th, at Bogart's in Long Beach on the 27th, The Belly-up Tavern in Solana Beach on the 28th, and the Coach House on the 30th in San Juan Capistrano. Luka ended his west coast series of shows with a gig at McCabe's in Santa Monica on Hallowe'en (the 31st) - a definite treat! Following that, Luka headed southeast for a couple of shows in Georgia in the beginning of November; one in Athens on the 2nd at the Variety Theatre, and another in Athens' Georgia Theatre in the 3rd. Luka played one final American show in Trenton, New Jersey on November 4th. Those of you who've been to these shows and would like to send in either your local paper's reviews or one written by you personally, by all means, do! I'll try to include as many as there's room for in the next issue. By the time this reaches you, Luka will be in the land down under. At press time, I have no itinerary for any confirmed Australian/New Zeeland dates. Please contact your local music paper or radio station for dates and venues. Unfortunately, it's been the case where I'll receive confirmed touring information after I've already gone to press. So, if any of you would like to receive an updated itinerary (with dates AFTER this issue has already been printed/mailed out), please send a self-addressed, stamped envelope, asking for an itinerary. As soon as I get the info, I'll then mail out the update to you. Plans for Luka's new album, though still some time away, are nevertheless in the works. It should be released some time in the coming year. More details to follow as they become available. On a sad note, Luka's mother passed away this past September. Mrs. Moore was a much loved person by all who knew her, and she played an important role in the musical influences in both Luka's and Christy Moore's lives. She will be greatly missed. Heartfelt condolences go out to both Luka and Christy, as well as all family members and friends of the Moores. That's it for now. As this issue has come out so late this year, I wish all of you warm yuletide greetings and a prosperous 1993. Issue #8 should be out some time in late winter/early spring. Until then, be well. The following interview was taken from this past August's issue of Bicycle Guide, where Luka was interviewed by the magazine's senior editor Keith Mills, as part of their regular "The Last Word" column. This interview was done back on April 26th, 1990 on KCRW, in California, on a program called SNAP. Halled as one of LA's best shows, and according to the staff there, the live version of "I Need Love" was a huge hit on the - the most requested song the station ever had! Requests from newer Connection subscribers who wanted a proper intro to Luka's background prompted me to obtain this one. Special thanks to Betsy Brown, who made this interview available for transcription. DEIRDRE: I'm Deirdre O'Donohue. I'm so happy to have with me tonight, Luka Bloom, a man who is as well noted in the press material as the first fellow from Ireland since Van Morrison to be signed directly to a major label here in the United States... Warner Brothers Records. Since I first heard Riverside, I, along with many other people, just fell head over heels for it. Solid, fine piece of work, Mr. Bloom. And welcome to KCRW. Welcome back to America. LUKA: It's great to be here, Deirdre. DEIRDRE: You just got off the plane this afternoon, yeah? LUKA: Just off the plane a couple of hours ago. I had a very quick breakfast in Dublin at the ungodly hour of 7:30 this morning. Took my last look at all the seagulled stuff on the wall beside the Irish Sea where I live in Dublin and got in a taxi and went to Dublin Airport and kissed the ground and headed for Los Angeles and here I am, laughing through the glass. DEIRDRE: I can hear it. Well, I think it's appropriate that your album begins with a laugh. A fine, hearty laugh. It definitely sets the tone for it. Well, let's not talk. Let me get you to sing. 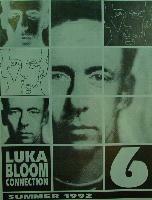 Luka Bloom. DEIRDRE: What a fine way to start things. Indeed it is. You couldn't have come at a better time. 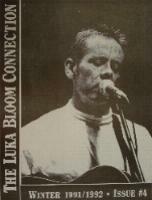 Luka Bloom is my guest here tonight on SNAB and is going to be performing at McCabe's, two shows, tomorrow night, the 27th. 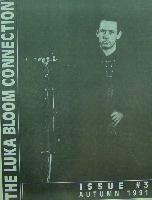 Now Luka Bloom is not the name on your birth certificate. How did you come to choose that name that the world would know you by, Luka? LUKA Around about 1987, I decided I wanted a new identity. An anonymous identity for my music. Nothing to do with my real name, which is Barry Moore, or anyhing like that. But I just wanted a new identity, because I knew I was going to come to America and I wanted something different. Something totally pretentious. DEIRDRE: So where'd you get the parts from? LUKA: Ah come on! It's pretty obvious, isn't it? DEIRDRE: It's just for fun, then. DEIRDRE: Now when you came to America, if I've heard this story correctly, you came to Washington, DC. DEIRDRE: And what was it that made you want to come and spend time here in America? LUKA: I've always wanted to come to America, ever since I was about 14 or 15 years of age and heard people like Doc Watson play guitar. I've always wanted to come to America but I never got it together. I never got enough money together to pay for the fare, for a start. And then I was too busy just roaming around Ireland and a little bit in Europe to be really bothered about it. I didn't really take what I was doing very seriously. And then I just made this decision in the middle of the '80s to just go for it. DEIRDRE: The time was right. LUKA: It's not so much that you trust your instinct. In my case it was more a question of desperation and wisdom borne out of desperation. DEIRDRE: How so? What was the desperation? LUKA: Ah, it was just sort of... there's only so many times you can play in Galway, do you know what I mean? DEIRDRE: Not personally, but I can imagine...(both laugh) Do you want to play another one here on SNAP? LUKA: Yeah! Just give me a second to tune up Rudy, though. DEIRDRE: Rudy's beautiful. Rudy's black. Is that solid? LUKA No, it's not solid, no. 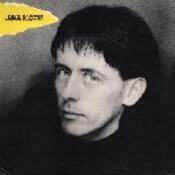 DEIRDRE: But Rudy will be there with Luka Bloom; tomorrow night, at McCabe's. LUKA: Nora is the blue version of Rudy. Nora is Rudy's sister. DEIRDRE: You certain do bring a nice sense to this country, Mr. Bloom. Beautiful. DEIRDRE: Thank you. What is it that you get from America, and what is that you take from your lrish and pull together? What are the strongest elements there, do you think? LUKA: Serious questions going on there. DEIRDRE: Shall I ask you a silly one? What's your favorite color? What's your shoe size? LUKA: (laughs)What do I get from America and what do I take from Ireland, or what do I take from America and what do I get from Ireland?... It really is... I suppose the first thing that I encountered when I came to America is what has since become one of my favorite words, which is attitude. (laughs) That's probably the thing that has affected my life more than anything else because some of the songs I sing now I had written just before I came out here, but I performed them with a certain lack of attitude, and as a result of coming to America and experiencing the sort of hope or optimism and enthusiasm that I encountered in my shows on the east coast when I first came here, I cultivated some of this attitude.You know, you pick up so much... so many little things... so many tiny little things. It's not... I can't define what it is I get from America. When people ask me "what's America like?" at home, I always say it's an impossible question to answer, because America isn't any one thing... it's a multitude of things. Each city is a multitude of things. That's my experience of it, anyway. And it always... one of the things that really annoys me about home, sometimes, is when people make generalizations about America. I think people in Europe tend to do that. I meet a lot of Americans who get a hard time when they go to Europe because people in England and Ireland have a very linear idea, a very one-dimensional idea of... when they think of America, they think of Dallas or McDonald's or of the sort of crasser side of corporate America. It's only whenyou come here... I actually met a guy on the street in Dublin yesterday, as it happens sometimes in Dublin. I had a really heavy row with this guy on the street because I told him I was coming back to America today, and he said, "Oh, I'd never live there." And I said, "why wouldn't you live in America?" and he said, "Oh, we've a much better way of life over here," meaning Ireland, and I said, "How do you know? Have you ever been there?" and he said, "No, I've never been there... I just know..." and it really...y'know, I hate that stuff! I just find there is so much to get from being in America. DEIRDRE: Where did you grow up in Ireland? LUKA: I grew up in a lovely little place (chuckles softly) called Newbridge, County Kildare. A great little town to grow up in as long as you get out of it when you're about 12. DEIRDRE: So it was pretty much out in the country. It wasn't an urban upbringing. LUKA: It was very close to the city, but it felt... it was a totally rural upbringing, yeah. Until I was 17 and then I moved to Dublin. And I've lived in cities ever since. DEIRDRE: Did you move to Dublin to go to school? Or just to take off and start playing? LUKA: (chuckles, then pauses) Both. LUKA: You know that sort of nonsense. My life's ambition was to be a second year student... and it still is! DEIRDRE: (laughing) I think you're doing a fine job of it. Would you like to sing another song for us, Luka? LUKA: (in a mock Irish accent, laughing) Ah sure, now, begobs and begorrah. Do you want one of my own or do you want something different? Something from the record or... what's your mood, Deirdre? DEIRDRE: It's entirely up to you... changeable. LUKA: Spring is in the air, isn't it? DEIRDRE: Ah, it's wonderful right now. LUKA: It's pretty amazing, actually. DEIRDRE: It's nice out here, especially at the coast. It's a little warmer inland. Want to do a spring song? DEIRDRE: (obviously impressed) The phones are lighting up with candidates calling in, Luka!You just made that song completely your own, didn't you? DEIRDRE: When you first heard that song did you imagine yourself doing a version of it that way? LUKA: It was one of those things. I was actually seeking... I wanted to learn a rap song because from living in NewYork over the years I just... y'know, you're surrounded by it so much, and it was such a new culture and a new style of music for me to hear because you don't hear so much rap except chart rap in Ireland, and so it was constantly everywhere... ghetto blasters, cars... everywhere you'd go. Initially it was very alien to me, but gradually it got under my skin and I wanted to find a song that would suit me, that I could work... that would work in my set. I wouldn't do something like that just for the sake of doing it, but when I came across that song, I felt that I could do it in a way that it would work... that it would make sense... it wouldn't just sound like an Irish guy trying to be a rapper, or anything like that. It's sort of like poetry in a way. I think it's a very beautiful song. DEIRDRE: I think you've made it your own...that is beautiful. Eat your heart out, LL Cooll! DEIRDRE: (laughing) Ah, the typical Irish diffidence! What shall I do with you? I shall ask you to play another song. Luka Bloom is my guest tonight here on KCRW. Riverside is the name of his album out on Reprise Records. Tomorrow night, he's going to be doing more of this for you at McCabe's. DEIRDRE: Now I want to see the video to that, having watched you move through that and hearing what you had to say. I like what you had to say about videos. I agree with you. It's one of the reasons why I love radio. You leave all of those elements to the imagination. It's not right that it should be depicted. That's why I like doing it. That's why I like having you here...Tomorrow night Senor Bloom will be at McCabe's here in Santa Monica doing two shows. Right now he's got Rudy, the black guitar with him. And I guess Nora stayed home tonight? LUKA: Well, Nora was a bit jet-lagged. Y'know, I opened up the case and took a look in and y'know she was looking a little bit like "I'm gonna give this one a miss tonight. Rudy's more up to it." DEIRDRE: Well, give her our regards. We'll see her tomorrow night at McCabe's... I have instructions, orders, commands and requests from a number of people... and I hope that you're gonna be able to do this or I'm gonna be in trouble... that we not allow you to leave the room unless and until you play "Delirious" ...is that possible? LUKA: (very enthusiastically) Anything... anything is possible! LUKA: I'll do it on one condition. LUKA: That the sound engineer doesn't turn my guitar down! LUKA: You can take off a bunch of reverb and away we go! I'm gonna sing this one for you, Deirdre, because I'm delirious to be back in America. This is the opening performance of my tour, you see. DEIRDRE: It's a perfect place to start! DEIRDRE: (obviously delighted) Indeed! Luka Bloom is my guest here tonight on KCRW and I could not be a happier Deirdre O'Donohue. What a pro you are! You went right through that, headphones flying off in the middle of things... didn't miss a beat! LUKA: They call it rock and roll, I suppose. DEIRDRE: Y'know, I don't know what to call what you do... other than glorious! I just love it! There's so many different elements that you pull in, from American blues and folk, hints of Irish traditional sort of senses and sounds. How do you feel about music as it's happening in Ireland right now? Do you feel heartened by it? Is it interesting? LUKA: ..in recent times, they would be... of course, people like Van Morrison and Thin Lizzy, the Rats... and various others... there've been lots of people over the years who's made great music out of Ireland. But at the moment there just seems to be huge bursts of people coming out of Ireland... and it's great. LUKA: Well,'I toured with both the Pogues and the Hothouse Flowers in America and Canada, and had great times with them... really great times with both bands. DEIRDRE: Does Luka need a rest? LUKA: Luka doesn't need a rest but... oh, boy look at the time... it's only a quarter to ten... there's lots of time left, isn't there? LUKA: Are you trying to tell me you want me to sing another song? Is that what you're getting around to here? DEIRDRE: (in a put-on Irish brogue) That's exactly what I'm sayin' to ye, Mr. Bloom. LUKA: Well, we're heading towards danger money time here. DEIRDRE: From his debut American album, Riverside, Luka Bloom, the story of Jacqueline... "Gone To Pablo", Have you imagined, when you mentioned the word poetry before... have you ever thought about putting to music any of the words of James Joyce? DEIRDRE: Well, yeah, there's a different emphasis when you do it that way. I think you give, again, I think, with what you said about radio versus video, versus the visual aspect... you allow the listener to bring their own interpretation or sense of it... I'm sometimes very startled and often disappointed when I read the words of a song that I've inadvertently made up my own words to, and I like my words better sometimes! LUKA: Of course. I think there are, obviously. I think that Bob Dylan is a poet. DEIRDRE: Now there's an example... people who are dedicated to putting printed words down on pages and who just read like great rollicking fun... shall we call you a seanachie? DEIRDRE: Not on the air! 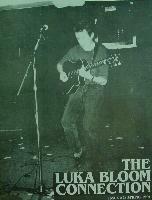 After the successful North American trip of 1987 in which the Luka Bloom concept came to fruition, Luka (aka Barry Moore) returned to Dublin in September of that same year in an atternpt to put onto record what he had achieved in America that summer. 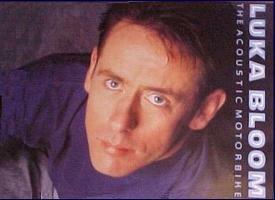 The result was the album, simply entitled Luka Bloom, released under the Mystery Records label in early 1988. Recorded in STS Studios in Dublin, the same studio that Luka returned to a few years later to record The Acoustic Motorbike, the album contains eleven tracks, three of which, "Gone To Pablo", "Delirious" and "Over The Moon", would later appear on his, Riverside album, albeit in a different form. lnteresting to note is that the producer of Motorbike, Paul Barrett, appears on this record as well, playing keyboards. What makes this album rather unique is that this is probably the closest you will ever get to hear Luka playng with a band, as it features no less than eleven other musicians, giving the record a much more "band" sound. Having kicked off his Barry Moore shoes and quiet persona, Luka gets happy as "Wild Life" begins side 1, a song made popular in his early live shows in America. This is an anthern of sorts, to the weekend warriors fleeing their yuppie environs to do battle with the forces of nature, in an effort to prove their manhood, providing of course they have the upper hand. Live, this song was a real thriller with its rapid-fire machine gun style guitar break, which sadly sounds very toned down in a studio setting, as does the overall pace of the song. "Parisienne" another popular song at his early live shows in New York and Washington, DC, also appears on this album - decidedly moody and haunting, alont the same lines of the later "You", from the Acoustic Motorbike album. Alas, like so many good earlier songs, it too has passed on into history. "Gone To Pablo", "Delirious" and "Over The Moon", well known to anyone who has ever heard Luka play or owns a copy of Riverside, are more or less the same as the versions on the aforementioned album, but with one basic flaw: over-produced to the point of being downright corny at times, and in turn, killing off any lasting effect these songs could have on the listener, particularly "Delirious", which features a playful but out-of-place sax solo during each chorus, which makes the song sound like a bad Spandau Ballet B-side. On listening to these three tunes, one can really appreciate Jeffrey Wood's rnasterful production on Riverside. In comparison to those songs, however. "Second Skin" is musically delightful. The same can be said for "lt's A Passion", whose intro bears an uncanny resemblance to U2's "Where The Streets Have No Name". "Little Boy" and "The Way You Talk To Me" are two more beautiful, rornantic ballads, in which Luka's vocals really shine. The ethereal sounding instrumental, "Te Adoro", which also appeared as the B-side of an early Barry Moore single called "Out On A Limb", and has been played for the last few years on stage as a segue between "Gone To Pablo" and "Rescue Mission". I don't think any recorded version of this song could ever capture the awesome presence it projects in a live setting, but nevertheless this version is excellent, very much in the vein of the later Japan and early David Sylvian recordings. Hopefully, if you do get the chance to hear this album, there's no doubt that you'll agree with my feeling that "Rodrigo Is Horne" is by far the best song on it, and is, to say the least, a truly magnificent piece of music, and without a shadow of a doubt one of the man's finest moments. Unlike In Groningen, which I reviewed in the last issue, there is still quite a large nurnber of the cassette version of this record knocking around, and if you search through folk music mail order houses, you should be able to lay your hands on a copy, which is well worth having in your collection, if not to be blown away by such wonderful songs as "Parisienne", "Rodrigo Is Home" and "Little Boy" then at least to compare reincarnations of the tracks that also appeared on Riverside. All in all, not an overly amazing debut album, especially when one considers what a truly gifted and talented singer/songwriter Luka is, but that's not to say it's not without some fine and memorable gems. You definitely get the overall feeling that something unique and wonderful is about to emerge. 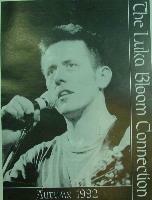 Many thanks to Vicky Romani for the issues of The Luka Bloom Connection!